Back in the days where my age was pretty much all I could count up to without running into trouble, I never would've thought Sesame Street would outlast the Electric Company. Now as Bert, Ernie, Snuffaluffagus and Elmo celebrate 40 years of educating and entertaining young minds, I guess the pop icons have made me eat my crayon-written words. 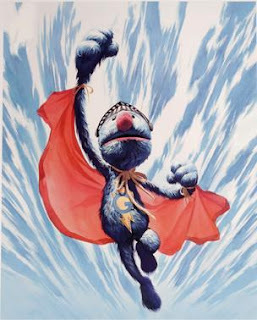 Instead of adopting the oh-so tempting 'Cookie Monster diet' in recognition of a job well done, I post this image of my favourite part of the show; Super-Grover - is there anything Alex Ross hasn't painted? Happy Birthday Sesame Street - congrats on turning the big 4-0! There;s even a new Palestian version as well. Very cool.